When the Trump administration released its latest budget proposal on Feb. 11, fans of human space exploration were dismayed to learn that it included plans to end America’s involvement in the International Space Station. 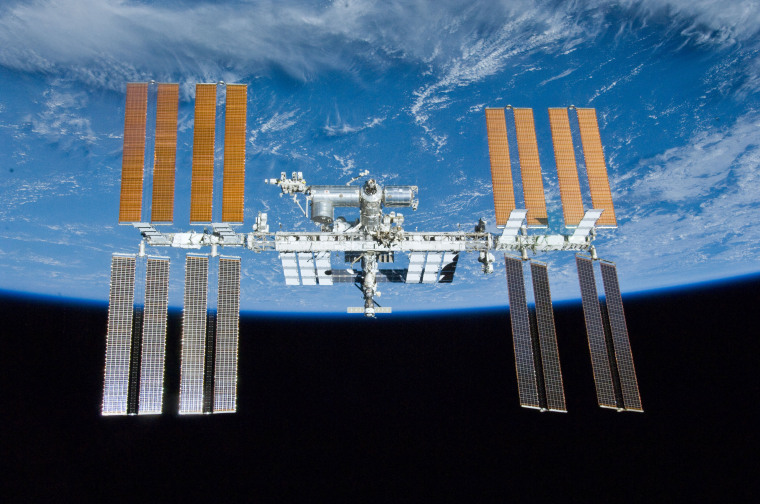 The proposal calls for the U.S. to sell its share of the ISS by 2025, treating the orbiting lab like some distressed piece of real estate in need of a buyer. Yet for much of the public — as well as to ardent space proponents, including former astronaut Mark Kelly — humanity’s only permanent outpost in space is an institution that needs to be protected. Kelly’s lament echoed loud across the internet. But a look back at the station’s long, messy history offers a different perspective. In the original plan, the ISS wasn’t supposed to end like this — because it was supposed to be a charred heap lying on the bottom of the Pacific Ocean by now. Since the launch of the station’s first component on Nov. 20, 1998, the ISS has logged 110,000 laps around Earth, covering more than 2.5 billion miles while hosting more than half of the 553 astronauts who have ever left our planet. But the origins of the ISS date back to 1984, when President Reagan announced plans to build Space Station Freedom in a Kennedy-esque state of the union speech. “Tonight I am directing NASA to develop a permanently manned space station and to do it within a decade,” he said. Reagan promised that the station would bring “quantum leaps in our research in science, communications, and in metals and lifesaving medicines.” It was also supposed to foster collaboration with Europe, Canada, and Japan while preserving America’s preeminence in space. Then came the harsh realities of translating Reagan’s vision into hardware. Freedom’s cost was initially estimated at $8 billion. That number quickly doubled, leading to a series of painful design compromises that still failed to stop the budget bloat. The station might not have been built at all were it not for the fall of the Soviet Union. In 1993 the U.S. and Russia signed an agreement to work together on a new International Space Station. The merger gained broad U.S. support as a way to keep Russian scientists gainfully employed (rather than, say, building bombs for the Taliban) while rescuing both nations from space station projects that had become embarrassingly unaffordable. Yet even with the Russian assist, the “$8 billion” space station has wound up costing the U.S. roughly $90 billion in construction and transportation over the 19 years it’s been operating. On top of that, we pay $3 billion to $4 billion a year to operate the station. Those expenditures have put NASA in a bind: The ISS was designed to be a gateway to new deep-space missions, but the agency cannot afford such missions as long as it continues to fund the ISS. As a result, for nearly two decades, American astronauts and their international partners have had nowhere to go except a canned outpost circling just 240 miles above the ground. Under this plan, NASA would end the regular rocket boosts that keep the station’s orbit from shrinking as a result of atmospheric drag. As the ISS drifted lower, crew members would be evacuated and then powerful strapped-on rockets would execute a series of firings, steering the ISS deeper into Earth’s upper atmosphere. Ultimately, the station was to have been steered into the Pacific Ocean, where there was little chance that debris would rain down on someone’s head. Except that NASA and its congressional overlords kept giving the ISS reprieves. By 2014, the official line was that the U.S. would move out of the ISS but that the station itself would survive at least until 2024. The Trump administration’s decision is hardly a new move against the ISS. It’s just one more in a long list of death notices. Anybody want a lightly used space station? The space-hotel concept appeals to the Russian space contractor RKK Energia, which recently proposed building an orbiting luxury resort (priced at $40 million per visit) using ISS-related hardware. But the resort would be housed in a new module that need not be part of the station itself. In the U.S., Robert Bigelow, CEO of Bigelow Aerospace, has proposed building space hotels, but his plans also do not revolve around the ISS. This week he announced a new company, Bigelow Space Operations, to build separate, private space stations, culminating in a supersized model with “over 2.4 times the pressurized volume of the entire International Space Station” late in the 2020s. That’s a new priority, but not exactly a new plan. Even before Trump came into office, NASA was pushing the Deep Space Gateway (since renamed the Lunar Orbital Platform-Gateway), a space station to be situated near the moon. Krauss is more optimistic about this project. “There is, at least in principle, something to do on the moon that would be useful, from learning how to do remote construction projects to science projects on the far side of the moon,” he says. The problem is money. NASA’s current five-year budget map shows zero growth, and in 2019 there is only a trickle of money for new space infrastructure. Private companies may yet come to the rescue. SpaceX CEO Elon Musk and Blue Origin CEO Jeff Bezos have both expressed interest in sending astronauts to the moon. Meanwhile, Bigelow Aerospace is seeking NASA support for another, more ambitious space station: an inflatable outpost, part hotel and part office park, located near the moon. Bigelow claims he can build it for $2.3 billion. China is the wild card. Since the launch of its first astronaut, Yang Liwei, in 2003, the China National Space Administration has followed a slow but methodical strategy, sending up a pair of space stations with a third, larger station set to begin operations in 2023. In a recent interview with Chinese state media, Yang Liwei confirmed that the country is also making tentative “preparations for a manned lunar landing mission” in 2036. In the long run, the end of NASA’s decades-long ISS project may mark the beginning of a new kind of space race: capitalist entrepreneurs versus the last communist superpower.